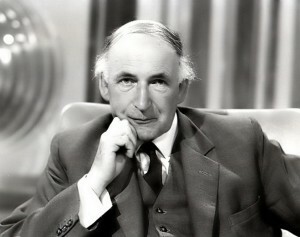 Happy 98th Birthday to Sir Bernard Lovell, founder of Jodrell Bank Observatory! Comments : Comments Off on Happy Birthday! Today’s wallpaper shows the Blanco 4-meter telescope at the Cerro Tololo Inter-American Observatory in Chile. I retrieved this image from the National Optical Astronomy Observatory’s image bank (click on the image for more wallpaper sizes). You know what else they have on offer? A great collection of astronomy-themed wallpapers for your iPhone. 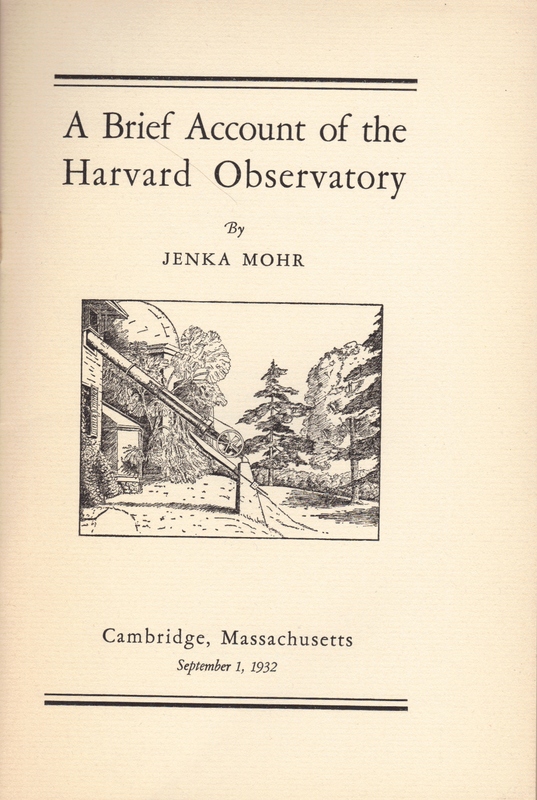 One of the most interesting birthday presents I received this year was a booklet published in 1932 called A Brief Account of the Harvard Observatory. Before I even read the first full page of the book, I found myself on a chase through archives, intent on drawing out a more feminist history on its author, a research assistant named Jenka Mohr. Mohr was a frequent collaborator with and the principal assistant to the director of the observatory, Howard Shapley. Biographical details for Mohr are hard to find, but while she worked at Harvard, she gave lectures on topics such as Beyond the Milky Way and The Magellanic Clouds: Our Neighboring Galaxies. She published at least one article as first author and a few as second and third author. She served as the editor to the THE TELESCOPE—An Illustrated Magazine of Astronomy, published bi-monthly by the Bond Astronomical Club at the Harvard Observatory. She also played the violin well enough to entertain her colleagues. 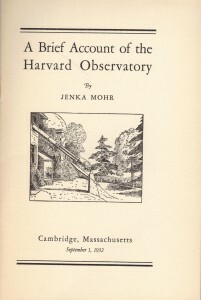 Mohr’s tenure at Harvard slightly postdates the era of the Harvard Computers (see George Johnson’s book, Miss Leavitt’s Stars: The Untold Story of the Woman Who Discovered How to Measure the Universe), but her workload seems to compare well with some of the assignments given to that cohort of women. For example, in addition to her more science-based duties at the observatory, she was charged with quite a bit of bibliographic work by the senior astronomers. There’s a longer story in Jenka Mohr’s career, I’m sure, and perhaps one day I’ll detail it on this website. In the meantime, you might notice the second distraction on the title page of the booklet, reproduced above. How often do you see a telescope poking upward through a second-story window? According to Mohr, this image depicted the 12″ “polar equatorial” telescope, installed in the observatory c. 1907. The telescope, with its axis parallel to that of Earth, is fixed in position on the south side of the observatory. The observer, sitting comfortably inside the building, looks through the eyepiece in the direction of the South Pole. 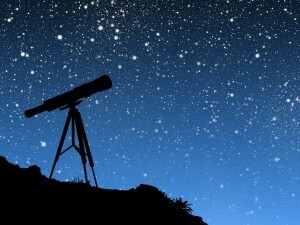 The images of the stars are brought into the field of vision not by moving the telescope, but by moving a 12″ mirror installed in the instrument after the dismantlement of a horizontal photometer. The entire southern sky could be viewed from a comfortable chair inside the observatory. According to both Bailey and Mohr, the telescope was used primarily for the observation of variable stars. That’s the cover page of the book. 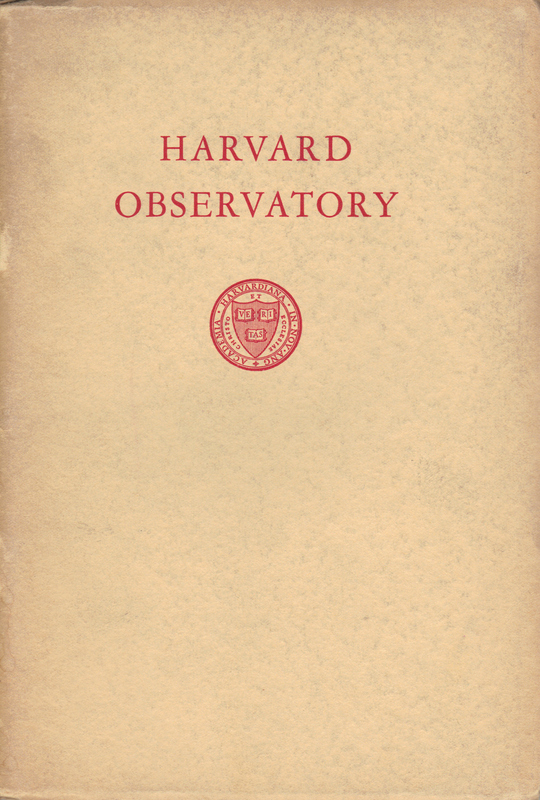 Imagine what I will have to write about the history of the Harvard College Observatory if I ever make it beyond the opening pages. See “Interview with Leo Goldberg by Owen Gingerich in Gingerich’s Office, Harvard University, August 9, 1983.” [http://www.aip.org/history/ohilist/28196_1.html] Goldberg is somewhat dismissive of her skills (calling her Shapley’s “Girl Friday,” for instance), but Mohr’s publications suggest that she knew what she was doing when working as an astronomer. In 1938, she served on the committee on nebulae and star clusters at the annual meeting of the International Astronomical Union in Stockholm, Sweden. Jenka Mohr and Harlow Shapley, “A comparison of the magnitude sequences in the two magellanic clouds,” Annals of the Astronomical Observatory of Harvard College, Vol. 105, No. 11, Cambridge, Mass. 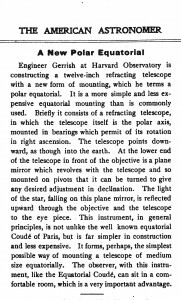 : The Observatory, 1937, p. 237-240; Harlow Shapley and Jenka Mohr, “Summary of a Variable Star Survey in an External Galaxy“, Proceedings of the National Academy of Sciences of the United States of America, Vol. 19, No. 12 (Dec. 15, 1933), pp. 995-996; Harlow Shapley, Virginia McKibben and Jenka Mohr, “Galactic and Extragalactic Studies, VII. Magnitudes of Forty Cepheids in the Large Magellanic Cloud,” Proceedings of the National Academy of Sciences of the United States of America, Vol. 26, No. 5 (May 15, 1940), pp. 326-332. See Star Fields, the Newsletter of the Amateur Telescope Makers of Boston Including the Bond Astronomical Club, Vol. 2, No. 2, Feb. 2001, p. 3. Jenka Mohr, Bibliographies of Edward Charles Pickering, 1846-1919 and Solon Irving Bailey, 1854-1931 Wash. D.C.: National Academy of Sciences, 1932; Annie Jump Cannon and Jenka Mohr, Biographical Memoir of Solon Irving Bailey, 1854-1931, Washington: National Academy of Sciences, 1932. 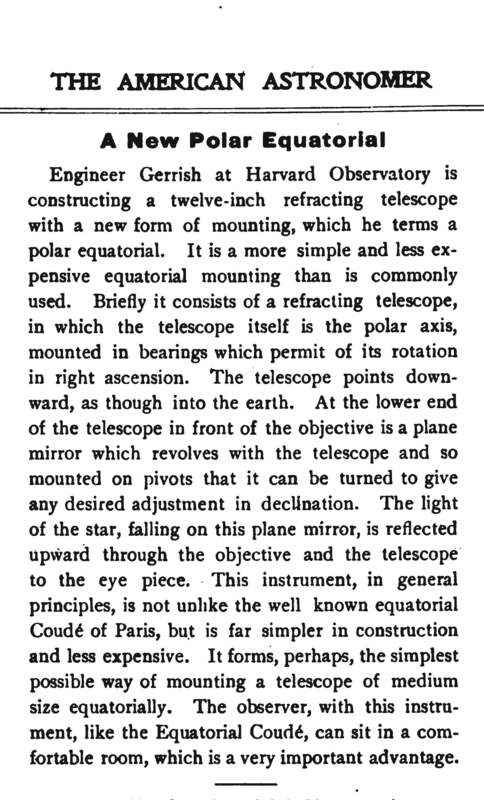 Solon I. Bailey, The History and Work of Harvard Observatory, 1839 to 1927, New York: McGraw-Hill, 1931, p. 45. 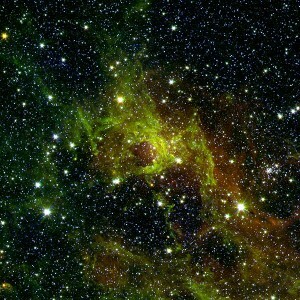 Happy Birthday to the Spitzer Telescope! 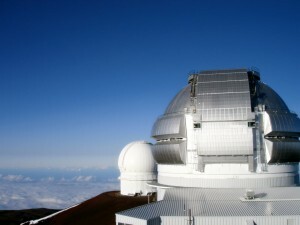 Here’s a daytime photo, to complement one of my all-time favorite night-time images of Gemini North, Mauna Kea, Hawai’i. Click on the image to download the wallpaper in various sizes, including those meant for mobile devices as well as desktop computers. Today’s wallpaper is a fanciful but eye-catching vector drawing of a small telescope silhouetted against an amazingly starry sky. Although the mission website is written in the future tense, NASA’s spacecraft Dawn is operating in the present tense. As of August 11, Dawn has been actively studying the asteroid Vesta in an attempt to clarify the creative processes of our early solar system. 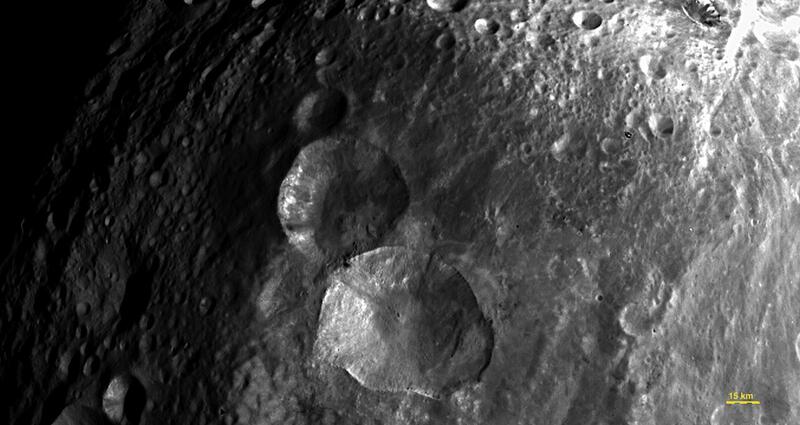 As the photo above shows, Vesta is a dry asteroid with a basaltic surface formed approximately 4.5 billion years ago. 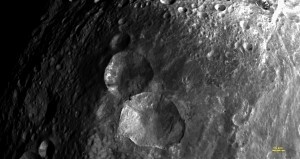 The surface has remained mostly intact ever since (that is, there is not sign of later extrusions of lava from the interior of the asteroid), although it does seem to be significantly cratered in certain sectors. In surveying the asteroid and comparing the results to other objects with origins in the early solar system, NASA hopes to determine the “evolutionary path” objects have followed during their (very long) lives. 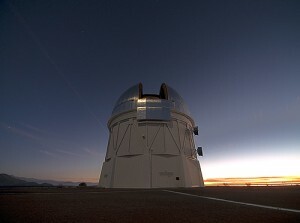 Using three different instruments, (a visible Framing Camera, a Visible and Infrared Mapping Spectrometer, and a Gamma Ray and Neutron Spectrometer), Dawn is attempting to capture data that will reveal both the external and the internal characteristics of Vesta. The framing camera is providing images of object in the visible range of the spectrum. The Visible and Infrared Mapping Spectrometer is taking measurements for comparison with laboratory samples to determine Vesta’s mineral composition. The Gamma Ray and Neutron Spectrometer is measuring the energy from gamma rays and neutrons emitted by or bounced off the asteroid. With these measurements, the research team will be able to determine the elemental composition of the asteroid as deep as three feet below the surface. 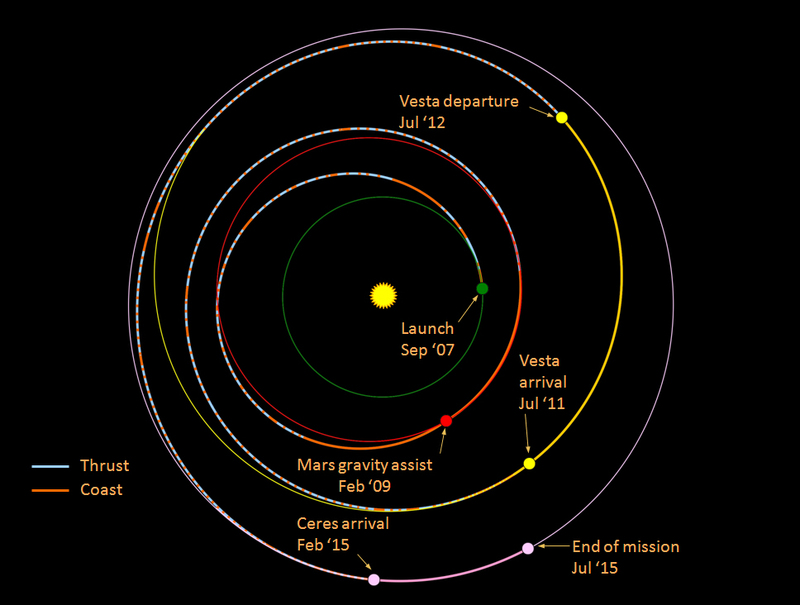 After Dawn finishes it survey of Vesta, it will move on to study of the dwarf planet Ceres. Ceres is quite different from Vesta—it has a “primitive surface” containing water-bearing minerals and appears to be similar to several of the icy moons of the outer planets of the solar system. It’s possible it may have a weak atmosphere. We’ll know soon (relatively speaking). 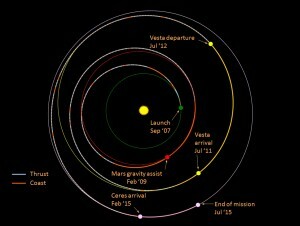 Dawn is scheduled to depart Vesta in July 2012 and arrive at Ceres in February 2015. Once the Ceres survey is completed, NASA should be able to make an informed comparison of the paths different objects followed during the early years of our solar system. If you’re interested in brass instruments, check out the instrument collection compiled by the Friends of the University of Illinois Observatory. The Newton & Co. sextant (pre-1896) is particularly sweet. In keeping with this week’s theme of archaeoastronomy, I’m sharing this lovely photo of Stonehenge. 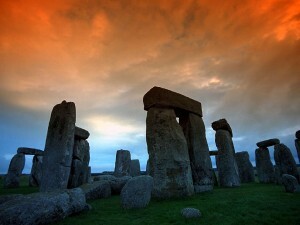 More Stonehenge wallpapers can be downloaded here.